XCIX, SPIE, Vol. 6803, San Jose (CA), USA, January, 2008.
commercial purposes, or modification of the content of the paper are prohibited. 3D-images and the results are compared, both with previously proposed quality metrics and with visual inspection. interchangeably and refer to the same signal type. 3D-image’s depth.1 Such a depth-dependent distortion cannot be measured by a single scalar. of 6 × 6 EIs. An overview of the scene is shown in Figure 2 (a) where a stereoscopic image pair is synthesized from the II-picture. tool when designing 3D-image coding schemes. distribution of coding artifacts in Figure 2 (a) and (b) cannot be discerned from Figure 3.
views are positioned for cross-eyed viewing. scheme #1 and (b) pre-processing and H.264-based coding scheme #2. Figure 4. Block diagram for the proposed quality metric. of the three constituting operations of the metric. 3. image pairs are constructed (for each depth layer) and are then evaluated using a 2D quality metric. (C0,k ) is shown to simplify the figure. no assumptions are made regarding scene content in order to enhance the rendering quality of each view. an object at distance layer d = 100 is positioned 100 · f meters from the image plane of the II-camera. would average any distortion that is not shared by all EIs. shorter depth of field, which is beneficial for the discriminating between depth layers. interpolation is adopted for the depth layer estimation. depth layer are discarded prior to applying the 2D-quality metric. applying the PSNR globally to the whole 3D-image when used in the context of depth layer images. Figure 6. Relative lenslet positions that are used to derive a specific image pixel for the base- and reference virtual image respectively. of size. The latter normalization results in increased discernibility of coding artifacts and is therefore used henceforth. be utilized. 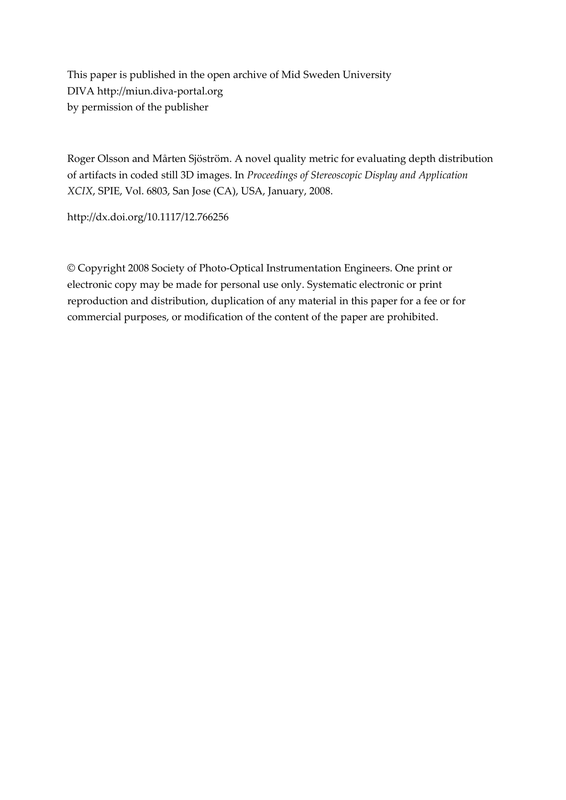 The selection of which depth layer to evaluate is, however, outside the scope of the metric. below 25dB at d = 125. Further analysis of the proposed metric is left for Section 5. Figure 7. Proposed quality metric applied to a 3D-image coded using the H.264-based coding schemes #1. Figure 8. The three 3D-images Twins, Apples and Car and their respective perspective projections and ground-truth depth distributions. and control layers with no known objects. Figure 9 presents center views of the 3D-images coded using all coding schemes, i.e. 12 perspective projection images. meant transferring a few from high to low d.
insufficient binocular parallax to determine depth. The Qd graphs of Figure 10 (c) shown no distinguishing properties. failure when detecting parallax in the smooth uniform-colored surfaces of Car. even more so when the rate is reduced. Figure 11. Rate-distortion images produced from 3D-image Apples coded with (a) coding scheme #2 and (b) JPEG 2000. (upper dashed line) values for (a) JPEG 2000 and (b) JPEG 2000 3D. extracted using the proposed quality is lost when its results are reduced like this to a small number of scalar values. images can show coding artifact as a function of both rate and depth giving a broader understanding of the effect of coding. algorithms is of special interest. integral images,” in Proceedings of Electronic Imaging - VCIP, IS&T/SPIE, (San Jose (CA), USA), January 2007. 2. R. Olsson and M. Sjöström, “A depth dependent quality metric for evaluation of coded integral imaging based 3dimages,” in 3DTV Conference, IEEE, EURASIP and MPEG-IF, (Kos, Greece), May 2007. 5. M. Tanimoto, “Free viewpoint television - ftv,” in Picture Coding Symposium 2004, 2004.
International Conference on Computer Graphics, Imaging and Vision: New Trends, pp. 347 – 350, July 2005.
images,” in Proceedings of ICIP 2006, pp. 513 – 516, IEEE, (Atlanta (GA), USA), October 2006.
multiview 3-d displays,” Signal Processing Magazine, IEEE 24, pp. 88–96, November 2007.
of SPIE Vol. 4660 Stereoscopic Displays and Virtual Reality Systems IX, 2002.
International Conference on Multimedia and Expo, IEEE, July 2005.
structural similarity,” IEEE Transactions on Image Processing 13, pp. 600 – 612, April 2004.
in Proceedings of RadioVetenskap och Kommunikation, pp. 663 – 666, (Linköping, Sweden), June 2005.
in Biomedical Optics & Medical Imaging, SPIE Newsroom , SPIE, 2007.